Having waved a very relieved and happy farewell to Cairo, we followed the Nile south, or at least we followed one of the many canals which have presumably been created from it. We really only got within sight of the actual river a few times; and when we did it was quite inspiring. Not that we had much opportunity for admiring the view, as the road cuts through village after village, where you are accosted by everything from dodgy speed humps and potholes to washer women and donkey carts. About midday, we stopped at a little roadside shop where, within minutes, the locals had erected a makeshift ‘cafe’ in our honour, complete with chairs, a table, bowls, glasses and a knife – and we only stopped for a cold Coke and some bread! It was a very heartening experience, full of genuine welcome and desire to make us feel comfortable, rather than much of the hassle and touting one experiences in more touristy places. The woman whose shop it was had such a lovely smile that I asked if we could take a photo, and I did, but it wasn’t great ‘cos she kept laughing and moving about. When I showed it to her, though, you couldn’t have asked for a more delighted reaction. It’s an encounter that was a real breath of fresh air – something there’s not a lot of around here, with the smog and dust creating a general haze which produces glorious sunsets but isn’t conducive to taking very good landscape pictures! Another feature of this leg of the journey was the interminable police convoy. 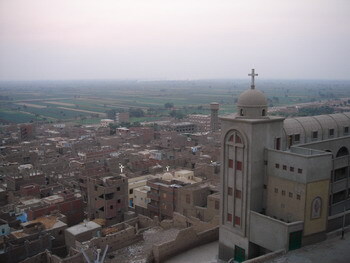 We picked this up part way through our ride to Asyut. Its function appears to be to keep us safe, although if that were the case you’d think they’d invest in some rear brake lights and some advanced (or even basic) driver training sessions! ‘So much for slipping quietly into town!’ Glyn shouted above the screech of their blaring sirens as we entered yet another wild west town, where no-one takes a blind bit of notice except possibly to greet one of their policeman friends. As the afternoon wore on, we found ourselves in something of a predicament. We knew that the only place we had heard of to stay in Asyut would close at 6pm. It’s a convent, set into the hills overlooking the valley, and we could imagine that it got pretty well shut up after that time, so we were desperate to get there. But every town we went through has its own police jurisdiction, resulting in a need for change overs between policemen. Some of these happened like clockwork, but as we got closer, they seemed to take longer and longer to organise, and at the final one (where you’d imagine they might have heard of the convent), they simply did not know where we wanted to go! We eventually rocked up at the intimidating gates with 15 minutes to spare. At first we were told that they were closed, but with some persuasion and lots of gesturing about sleep, we managed to get inside. With great pride, we were shown the cave where the ‘holy family’ apparently stayed when on the run from Herod. From the surroundings, you do kind of feel like you might have stepped back into biblical times, so it makes this claim all the more believable. I thought it was a nice touch, therefore, that the following morning, as we were leaving, the gatekeeper was the first person we’ve come across who blatantly asked for ‘baksheesh’. ‘You give me five pound’ he said. When I asked what for, he repeated the demand and then said ‘yes or no?’. My ‘no!’ must have been emphatic enough, because he stopped stalling us, with the ruse that he was calling the police, and let us go. Not that it lasted long – we were picked up an hour later and summarily escorted south, much to our chagrin and the local constabulary’s delight! … Well, we’ve managed to do everything we set ourselves in Cairo! It’s not been easy, and we took it to the wire, but we did it! 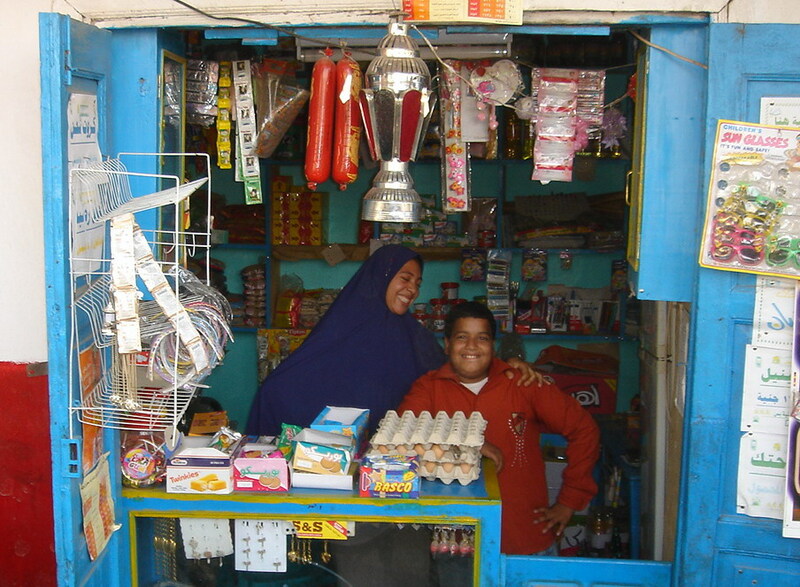 Those who are uninitiated might think, as we naively did, that in a large city like Cairo it might be relatively easy to get everything you need with a minimum of fuss and not much effort. Alas, we had not accounted first of all for the 3 days of weekend and public holidaying associated with Eid which would greet us when we arrived in this dustbowl of a city. At first this was very annoying, as we just wanted to get on with our chores; but it did actually turn out to be a blessing in disguise, as it gave us time to do the touristy things (they were open, thank goodness!) as well as just have a day of R&R at a local resort (posing, as you do, as one of the paying guests!). All the while, we were, however, on tenterhooks about two things: whether or not we would be granted a visa to enter Sudan, and how on earth we would get Glyn’s bike’s rear sprocket bearings seen to. As is often the case with these things, though, we needn’t have worried. After Eid was over, we made a beeline for the Sudanese embassy, which we’d taken the opportunity to find when roads were quieter over the holiday period. This wasn’t an easy task, as it’s a bit hidden away among a variety of other embassies in a suburb known, generously, as Garden City. We were the first eager beavers to arrive, and waited at the back door to which we’d been ushered until 9am. By 10am, we’d finally been issued with some forms to fill in, and joined a queue that now threatened to overrun the only open counter. The forms required photocopying (for which there is a charge) and the visas cost $100 each, so it wasn’t a cheap exercise. But we got them! And all within two hours! What elation. We were told to return in 2 hours time for our passports with visas suitably attached. This gave us just enough time to rush over to the BMW Bavaria Auto which we’d located on our scouting mission over the weekend. However, having been told previously by staff who came to the gate that ‘of course they could help’ a suit behind his polished desk now told us that this BMW dealer just ‘doesn’t deal with bikes’ (adding, pointedly, but non-verbally, that he would much appreciate it if we would kindly remove our rather mucky bikes, and selves, from his pristine forecourt). We were given the name of someone who might be able to help, and some sketchy directions, but were dubious about this ‘friend who knows a friend’ suggestion. This put something of a dent in our spirits, as we had hoped that this chore would be a simple exercise. We opted for our Plan B, which was to go in search of the ‘largest Suzuki dealer’ in the country. Much good this did us. When we finally arrived at what would be the only bike shop we’ve seen in Cairo, it was closed. Plus, it was only the size of a broom closet! By this point, we were hot, bothered, and seriously fed up, having endured a nightmarish ride through parts of Cairo that no tourist should ever be allowed to see. We returned to camp, again via some rather dodgy parts of town, a bit down at heart and hungry too because we’d had no time for lunch, and our supplies for dinner were at an all-time low. Thankfully, cup-a-soup and a strong lager saved the day! This morning we were considering not bothering to fix Glyn’s bike, since it seemed to be running OK now anyway. We did need to swap over to our off-road tyres though, but had decided to get this done by one of the many roadside tyre-lever jockies that we’d seen in Cairo. Fortunately, the one near us was closed when we went. Next door said they’d be 2 hours, so in the meantime we headed for the nearby shopping mall to stock up on some ‘luxuries’ (tinned tomatoes, mosquito bite cream and dental floss – you know, life’s essentials). We also treated ourselves to a cappuccino each! Imagine that! Anyway, this mall is not far from said BMW dealer, so in vain hopes of discovering that they perhaps had the relevant spare part, we returned to them and were again told that there was a guy who knew a guy (etc.!) who could help. This time there was no denying it. Resistance was futile. And anyway, what option did we have? The same pattern of riding for a bit, stopping for directions (mostly delivered in a mixture of sign language and Arabic), moving off again (repeat ad infinitum) was followed for about 45 minutes. Eventually, though, we did locate Mr Hamdy Motos. He was evidently asleep, and with the help of a fruit seller whose stall sits beneath his window, we managed to wake him up (it was 2pm). Long story short? He did know a guy who was a motor mechanic: Azoz (pronounced ‘azuuz’). Two hours of his efforts, a lot of grease, and some twenty quid later, we were sorted. A very good thing it was too, as Glyn’s rear sprocket bearing was absolutely fine; but Cathy’s was a total disaster zone! Much further, and it would have been sure to give up the ghost, giving us far more cause for being down in the dumps than we have experienced this far! All in all, we have been incredibly lucky. Although neither of us are particularly keen to visit this city again, we did manage to achieve everything we set our sights on – and that within the 6 days which Glyn’s itinerary allowed for. Howzat!? Tunisian authorities, spraying down (presumably with water) the electricity pylons; a job we both agree is not one we’d be first in line for. The spread of mass tourism from Alexandria west along the Med, which results in a peculiar duality as you drive towards Alex; on the right a vast desert and occasional settlement, and on the left, sprawling replicas of the villas and golf courses, all of them currently unoccupied. What’s most depressing about this site, is that it’s harshest when you reach El Alamein, scene of such devastation in World War II and the place Cathy’s grandfather actually fought at in the war (and happily returned from, although with shrapnel wounds). It’s really odd to see what was a battlefield being turned into water-hungry tourism resorts. One sign along the way made us both laugh: it was on a banner strung over one of many the building skeletons which you pass en route. It will, presumably, one day be a new shopping centre in the middle of the desert, and it read ‘Dunes – space for rent’. Just brilliant! We’ve had a good laugh too at typos like ‘city enterence’ and ‘worled class performance’. 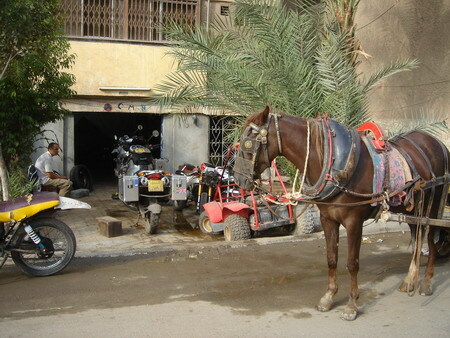 The popular mode of transport has changed dramatically between the African countries we’ve been in to date: in Tunisia it was mopeds, in Libya everyone and his dog has a car, and in Egypt it’s donkey carts. We both saw a chap in Tunisia riding his moped, and thought he was riding side saddle, but as we got closer it was obvious he just had one leg! We agreed afterwards that it’s likely he lost the right one while riding his beloved moped! We’ve also seen grandfathers riding their bicycles, with little babas happily perched on wooden boxes in the back – granddad checks every now and then, putting out his right hand, to see by touch that she’s still there. Buckle up and please do not litter signs in Libya. This is a laugh! So are the speed limit signs of 80kms an hour. I joke not when I say that the average traffic speed in Tripoli was more like 80 miles per hour! Seriously, even Cairo’s traffic is not this hectic; although that said Cathy was very nearly run over by a large, air-conditioned, pyramid-visiting tourist bus in Cairo today. It was only by the skin of her very nervous teeth that she managed to avoid it’s ship-like progress towards the right hand kerb – evidently it had decided to turn right from the middle lane of a busy road; not caring a jot what was travelling in the slow (right hand) lane! Never has anyone been so pleased to still be upright after a heart-stopping couple of seconds in which you expect to hear the grate of metal on stone!